Ever since Han, Luke, and Chewbacca triumphantly strode through crowds of Rebel soldiers to mark their roles in the Death Star’s destruction, Star Wars fans have jokingly wondered why the poor Wookiee was left out. Well the final issue of Marvel’s Chewbacca miniseries has an answer, all these years later. 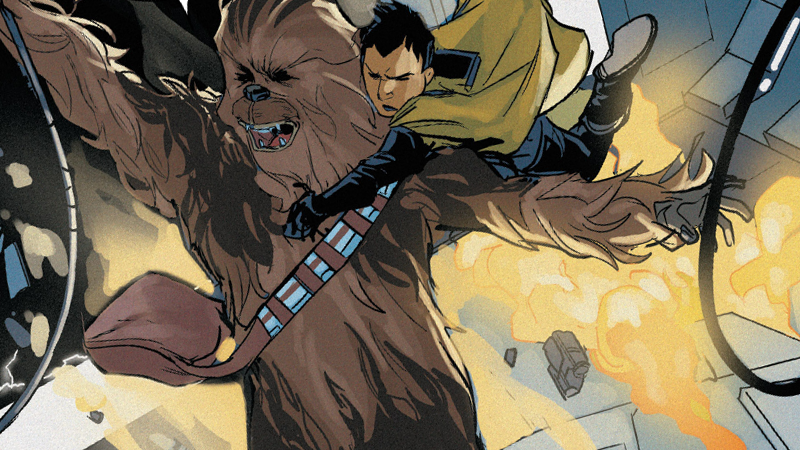 Minor Spoilers ahead for Chewbacca #5, by Gerry Duggan, Phil Noto, and Joe Caramagna. Chewbacca #5 serves as the culmination of a short adventure a crash-landed Chewbacca has had with a young girl named Zarro. The duo has freed Zarro’s father from a local thug’s mines and escaped the clutches of the Imperial troops said thug was working for. Following an explosive escape from a Star Destroyer, Chewbacca and Zarro make to go their separate ways... but not before the young girl says it would’ve been nice if they had some recognition of what they did to save the planet from the Empire. His medal! Turns out Chewbacca had one after all, presumably given to him after the main ceremony. Maybe Princess Leia didn’t want to have to use a stool to get high enough to put one on him in front of so many Alliance soldiers? Or maybe Chewie was just being shy? Chewbacca goes on to tell Zarro that he’s not too keen on having the medal anyway. It clashes with his “warrior vibe,” according to Zarro’s translation of his roars. Poor guy, but at least we know he wasn’t left out back on Yavin—or why we’ll never see him with the medal again. Marvel’s Star Wars comics have been doing a pretty fun job of filling in the gaps between the movies in Disney’s new canon. While it’s been nice to theorize all these years about whatever happened to Chewie’s medal (because that’s the sort of thing Star Wars fans love to do, let’s be honest), this is a pretty cute way to touch on it in Disney’s new official capacity as custodians of all things Star Wars.